This book tells how presidents and other prominent figures have shaped public memory of the turbulent 1960s. Over the past quarter century, American liberals and conservatives alike have invoked memories of the 1960s to define their respective ideological positions and to influence voters. Liberals recall the positive associations of what might be called the good Sixties -- the Camelot years of JFK, the early civil rights movement, and the dreams of the Great Society -- while conservatives conjure images of the bad Sixties -- a time of urban riots, antiwar protests, and countercultural revolt. 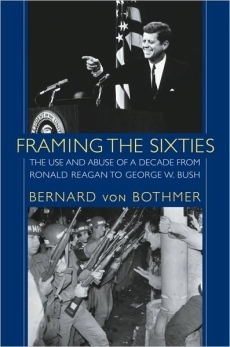 In Framing the Sixties, Bernard von Bothmer examines this battle over the collective memory of the decade primarily through the lens of presidential politics. He shows how four presidents -- Ronald Reagan, George H. W. Bush, Bill Clinton, and George W. Bush -- each sought to advance his political agenda by consciously shaping public understanding of the meaning of the Sixties. He compares not only the way that each depicted the decade as a whole, but also their commentary on a set of specific topics: the presidency of John F. Kennedy, Lyndon Johnson's Great Society initiatives, the civil rights movement, and the Vietnam War. In addition to analyzing the pronouncements of the presidents themselves, von Bothmer draws on interviews he conducted with more than one hundred and twenty cabinet members, speechwriters, advisers, strategists, historians, journalists, and activists from across the political spectrum -- from Julian Bond, Daniel Ellsberg, Tom Hayden and Michael Dukakis to James Baker, Robert Bork, Phyllis Schlafly and Richard Viguerie. It is no secret that the upheavals of the 1960s opened fissures within American society that have continued to affect the nation's politics and to intensify its so-called culture wars. What this book documents is the extent to which political leaders, left and right, consciously exploited those divisions by framing the memory of that turbulent decade to serve their own partisan interests. To learn more about the book, go to www.framingthesixties.com.